Treasures of the Pharaohs Classic Slot Review - Casino Answers! Treasures of the Pharaohs is a 3-reel, 1-line classic slot machine developed by Top Game, featuring a wild symbol. You can play the Treasures of the Pharaohs 1-Line classic slot machine at Bovada. Treasures of the Pharaohs is a penny slot. Bets on the Treasures of the Pharaohs slot machine are $0.01, $0.05, $0.10, $0.25, $0.50, $1, $3 and $5. You can bet 1-3 coins per spin by pressing the “Select Coins” button. You can bet up to the maximum total bet of $15 per spin. Treasures of the Pharaohs has a decent betting range available for most online slots players. To play the Treasures of the Pharaohs slot game, select your bet and press “Spin.” To play the maximum 3-coin bet, use the “Bet Max” button to spin the reels. The top-paying symbol on the Treasures of the Pharaohs slot machine is the Ancient Coin symbol. If you hit 3 Star Spangled 7’s on the center payline, you will win the 6000 coin top jackpot. The Ancient Coin symbol is wild and will substitute for the other symbols on Treasures of the Pharaohs. You can win this top jackpot by playing now at Bovada! 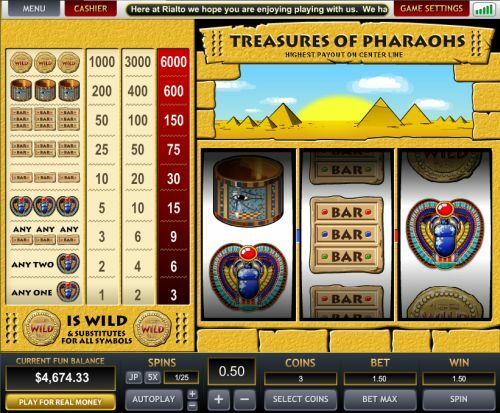 There are 9 winning combinations on the Treasures of the Pharaohs 1-Line classic slot machine. The complete payout schedule is as follows (1/2/3 coin payouts in parenthesis): 1 Scarab Amulet symbol (1/2/3), 2 Scarab Amulet symbols (2/4/6), any 3 Bar symbols (3/6/9), 3 Scarab Amulet symbols (5/10/15), 3 Single Bar symbols (10/20/30), 3 Double Bar symbols (25/50/75), 3 Triple Bar symbols (50/100/150), 3 Copper Bracelet symbols (200/400/600) and 3 Ancient Coin symbols (1000/3000/6000). Treasures of the Pharaohs has a basic autoplay mode. You can use the “5X” button to play five autoplay spins or hit the “JP” button to play until the jackpot is won. If you would rather play a specific number of automatic spins, use the “+” and “-” buttons to select up to 95 autoplay spins. To start the autoplay feature on Treasures of the Pharaohs, use the “Autoplay” button. You can stop Treasures of the Pharaohs’ autoplay mode at any time by using the “Stop” button. The Treasures of the Pharaohs slot game is an Ancient Egyptian classic slot with a healthy top jackpot and a wild symbol. To play the one-line version of the Treasures of the Pharaoh slot machine, sign up today at Bovada! Are American players able to play the Treasures of the Pharaohs classic online slot? Yes, players based in the USA can play Treasures of the Pharaohs at Top Game online casinos like Bovada. Where can I read more Ancient Egyptian slot game reviews? If you’re obsessed with Egypt and the Treasures of the Pharaohs casino game simply isn’t enough for you, you can read more Egyptian slot reviews on our complete list of Egyptian slots. Can I play a Treasures of the Pharaohs free flash game in my web browser? No, there currently isn’t a flash casino available that will play the Treasures of the Pharaohs fruit machine.